Faster production turn-arounds with better finishes. With our HAAS E5-5-4AX Machining Centre, Benthams can offer 5th dimension CNC machining utilising the latest in SolidWorks® design and programming. This 5th axis gives us the ability to angle and position the head, allowing us to use shorter, more accurate cutters to machine compound holes with much greater accuracy and speed, reducing the need for multiple set-ups and eliminating the requirement for any hand-finishing. Working area 1320 x 515 x 1016 – full flow 5 axis CNC machining. 5 axis machining of materials from aluminium, steel, cast iron to plastics and resins. 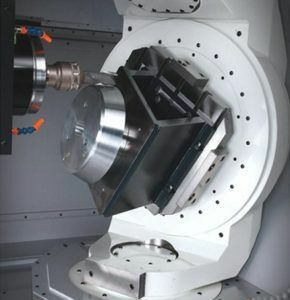 Complex 5 axis machining undercuts and compound holes.